Health & Beauty	2019 Home and Garden, 2019 Home and Garden Show, 2019 KHTS Home and Garden Show, 2019 Santa Clarita Home and Garden, California Home and Garden, California Home and Garden Shows, Health, Hygiene Products, Organic Products, Santa Clarita Events, Santa Clarita Home and Garden Show, Santa Clarita Soap Maker, Soap, Vegan Products, Wildflower Sopaery Co.
Wildflower Soapery Co. was created out of a hobby and the love for all natural products. Creator Danielle started this natural soap company out of a personal desire to have safer and more natural soap products instead of choosing between store bought soaps, which tend to have more additives and chemicals. Danielle uses only the highest quality of ingredients and buys organic wherever possible. Their soaps use vegan and cruelty free fragrances, essential oils, herbs, and more. They do use glitter, but the glitter is biodegradable as well. All of the soaps and production from Wildflower Soapery Co are handmade and created in small batches. The soaps are poured, decorated, cut, packaged, and labeled all by hand. If you’re interested in knowing just how the soap purchased here is being made you can view the process online when you visit their YouTube channel. At Wildflower Soapery Co. you can find more than soaps. Wildflower Soapery Co has products that range from soaps, to wax melts, body polish, body wash, and even lip balms. 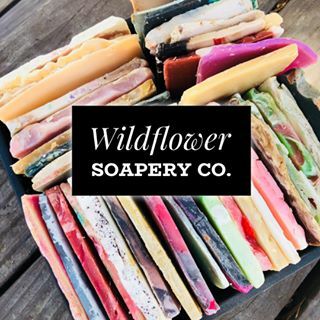 If you’ve been looking for vegan cruelty free, sustainable, phthalate, preservative free, and biodegradable soaps and bath products then Wildflower Soapery Co. is the company for you. You can visit them on their website for more information, and a list of the ingredients they use in their products. To learn more about Wildflower Soapery Co., click here.